The Apollo 11 Lunar Module "Eagle" is photographed on July 20, 1969, in lunar orbit from Columbia. 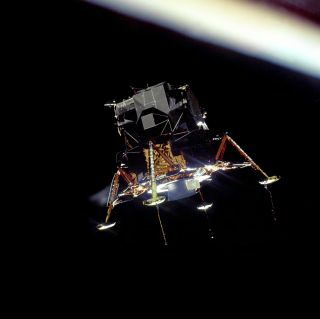 In this historical photo from the U.S. space agency, the Apollo 11 Lunar Module (LM) "Eagle," in a landing configuration is photographed on July 20, 1969, in lunar orbit from the Command and Service Modules (CSM) "Columbia." Inside the LM were Commander, Neil A. Armstrong, and Lunar Module Pilot Edwin E. "Buzz" Aldrin Jr. The long "rod-like" protrusions under the landing pods are lunar surface sensing probes. Upon contact with the lunar surface, the probes send a signal to the crew to shut down the descent engine.